Download the all-new Harbour Air App today! Let’s fly! Managing travel from your mobile device just got easier with the all-new Harbour Air App. It all starts with the dynamic home screen where you can see current weather conditions, view your upcoming reservations and even save your favourite flights for quick bookings at the touch of a finger. Plus, see what the Harbour Air experience is all about with our all new virtual reality videos. Browse schedules and book flights with just a few taps. The “Frequent Bookings” feature remembers your preferred routes, making it even faster to complete your reservation. Plans can change, we get it. Use the “My Flights” screen to change or cancel bookings while you’re on the go. Staying up-to-date with Harbour Air is simpler than ever. Receive flight notifications, find flight status information, and check the balance of your High Flyer Rewards points. 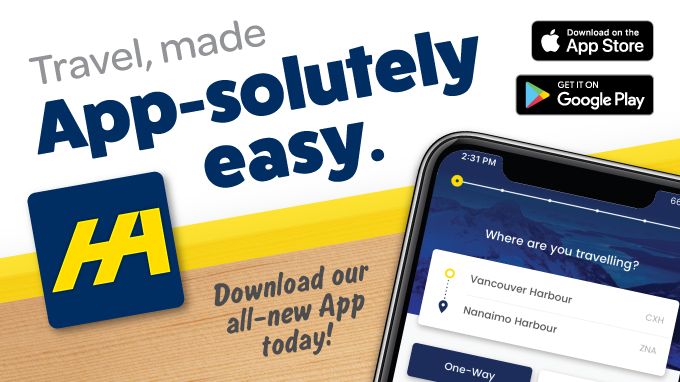 For travel made easy, download the Harbour Air App today! The App is compatible with both Apple and Android devices and is available to download from the App Store or on Google Play. Have feedback to share about our new App? We would love to hear from you. Click here to get in touch. Unaccompanied minor? Please call 1.800.665.0212 to complete the reservation. Passenger count exceeds the 7 passenger limit.